I love that Vintage is Trendy and New! Here is a card that I received.. I loved receiving a card (I don't always get to enjoy cards made by others... what a pleasant surprise!). Chalk Talk (#130634) is a fun and cool new stamp set. It mimics the oh so trendy and cool Chalk writing and art.... with no mistakes made by me (lol). Heat Embossing with our Heat Tool (#129053) and the White Embossing Powder (#109132) for a sharp and raised chalk-like look! Our Extra-Large Oval Punch (#119859) makes it easy to POP out a perfect creation! 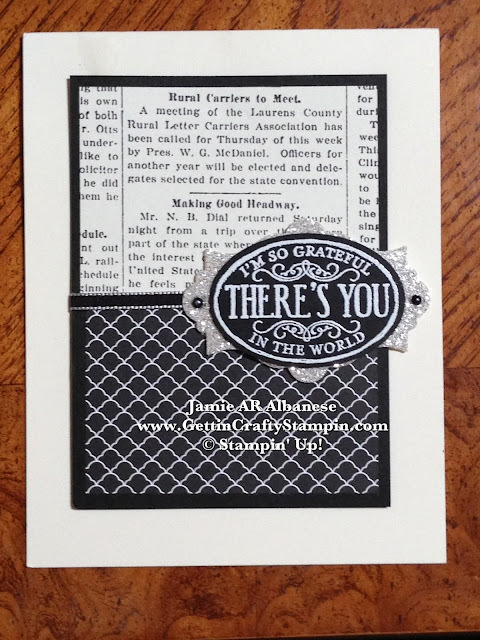 I love that our stamps coordinate with our Framelits and Punches for an easy but stylish look! 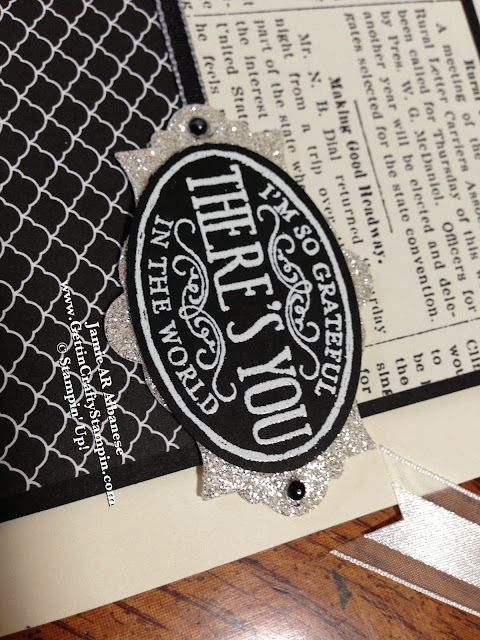 Accent this oval sentiment with this cool and funky Apothecary Accent (#127003) framelit and our Silver Glimmer Paper (#124005). Layering this cool and funky shape mimics the new Modern Medley (#126926) Designer series paper. 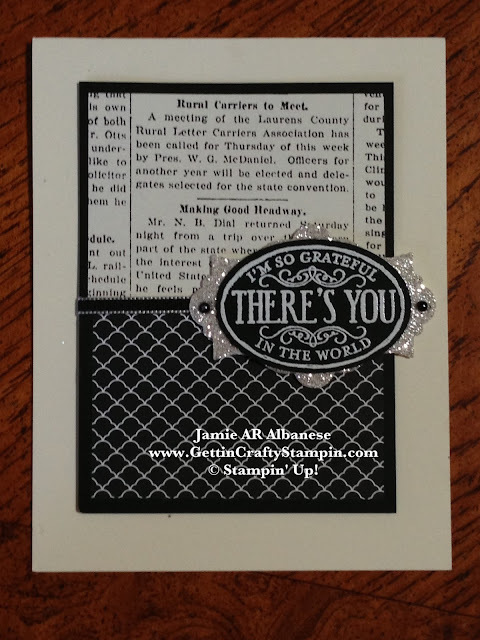 This paper is one of my favorites, is a neutral but still exudes vintage style. Black Accents like this Permanent Marker colored in adhesive backed Pearl Basic Jewels (#119247). These Pearls and Rhinestones change into almost any accent you need with a simple swish of color from a Perm. Marker (like a Sharpie or Bic). Don't you just love the sharp contrast and coordination this little accent brings to this project?? Vintage but Trendy and Cool?? This card BRINGS IT and more! I have a few new black and white dresses... this card reminds me of them... now to make sure I add sparkling accessories - lol. What do you find that is Trendy but Cool? Vintage but New?? Leave me a comment and let me know!! Like this card?? Share It, Pin It, Facebook, Tweet, Email, Instagram, it!! Remember that sharing the love is almost as fun as mailing this card to others... and you are supporting me and my love and passion for card making and crafting! Don't walk this crafting world alone... Follow Me (on Pinterest, Facebook, Twitter, Instagram, YouTube, The Vine, Foursquare, LinkedIn and more)!! Let's take this walk together, it will be more fun that way - lol! CLICK HERE to see ALL of our Catalogs of Stamps, Papers, Accessories, Tools and more! Shop 24/7 from the comfort of your own home... and earn Frequent Buyer Club points!! I look forward to seeing you again and soon!